Seth Bloom and Christina Gelsone (The Acrobuffos) are a world-famous clowning duo who have arrived in Melbourne from New York City to perform Air Play, their epic comedy adventure filled with breathtaking air sculptures and laugh-out-loud physical comedy - minus the big shoes and red noses. Miss Ruby and I attended the opening night of Air Play at Arts Centre Melbourne and were completely blown away by how beautiful it was and happy it made us feel. We smiled, we laughed, we gasped and we were totally mesmerised by the entire performance. 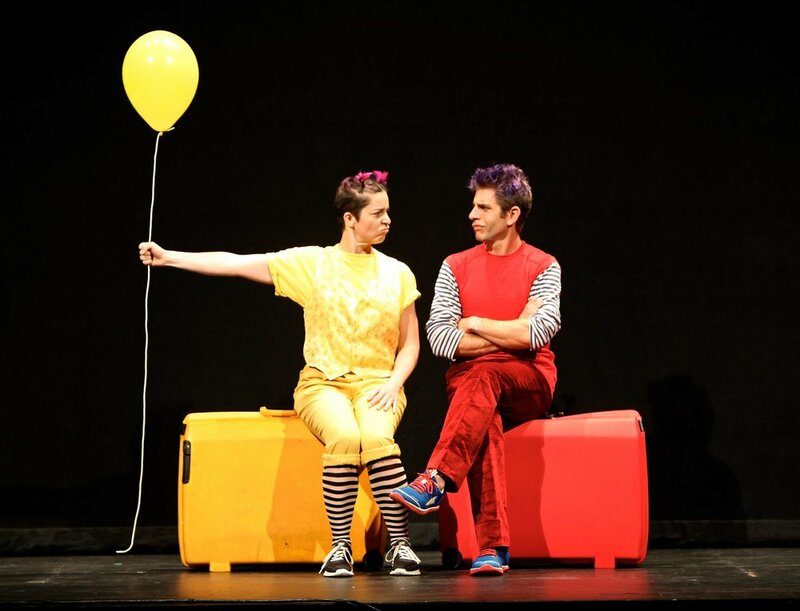 Air Play is a circus-style adventure of two siblings (sporting brightly coloured hair and coordinating outfits) journeying through a surreal land of air, transforming the ordinary into objects of uncommon beauty. Fabrics dance in the wind, balloons have a mind of their own, confetti turns into the night sky, and an enormous canopy of hovering silk floats over the audience. Seth and Christina collaborated with air sculptor Daniel Wurtzel to create a show that captures the innocence and wonder of childhood. The husband and wife duo pull surprises out of suitcases, defy gravity with clever use of fans (22 in total) and even climb through the audience, inviting willing participants to join in the fun with no pretence at a fourth wall. Our favourite part was seeing the clowns go from juggling enormous balloons to climbing inside one. POP! Seth’s balloon bursts and crumples to the floor. “Was that supposed to happen?” asks Ruby. I guess we will never know but it certainly sparked the biggest laugh from the audience of the night. Set to awesome music (ranging from Erik Satie’s ‘Gymnopédie No.1’ to Nancy Sinatra’s ‘Bang Bang – My Baby Shot Me Down’) and with a running time of just under an hour, Air Play is a combination of visually stunning sculptures and cheeky but heartfelt storytelling that can be enjoyed by anyone, no matter how old they are. You’ll be floating out of the theatre afterward. For more information or to buy tickets to Air Play at the Arts Centre Melbourne, head to their website. Les Moutons (The Sheep) are taking up residence on the Arts Centre Melbourne Lawn from Thursday 19th to Sunday 22nd Jan for an unforgettable stay – don’t miss this FREE event before or after you see Air Play. KATE'S REVIEW ON THE BLOG NOW VIA THIS LINK.